Breakfast is served between 7:30 am and 7:55 am. At 7:30 am* students eating breakfast may enter the building and directly check in with Cafeteria staff. At 7:45 am students arriving through Carpool line, may proceed to cafeteria for breakfast. Breakfast is served until 7:55 am. Please note- Sending students in at 7:30 am who are not enrolled in Early Bird nor eating breakfast is not permitted. * If your student utilizes the van services. Parents must notify the van service that students may not be dropped off for breakfast prior to 7:30 am or left unattended at the gate. 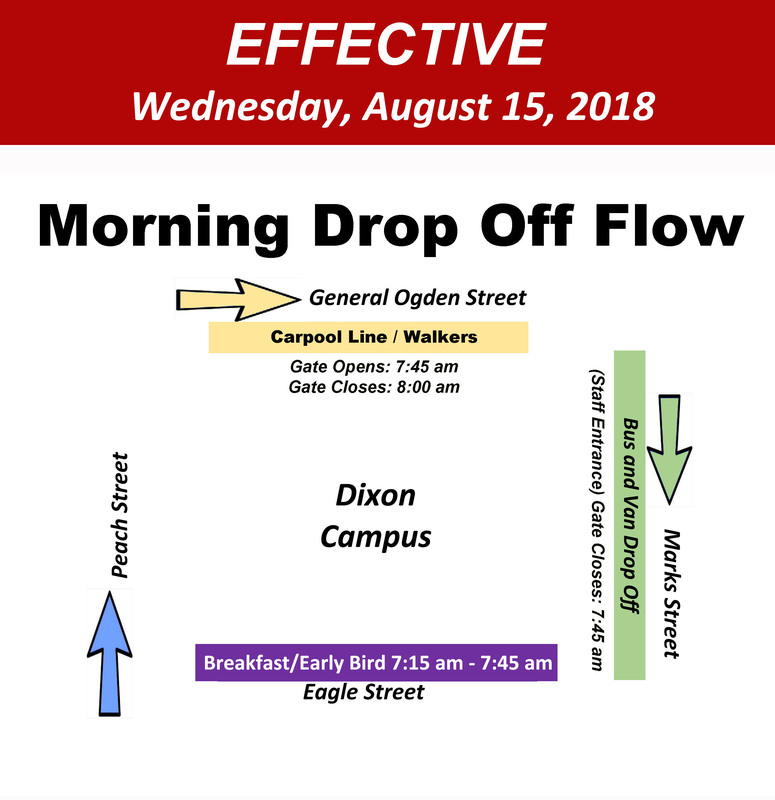 The Dixon Campus opens its gates at 7:45am. Parents may make use of a carpool line. 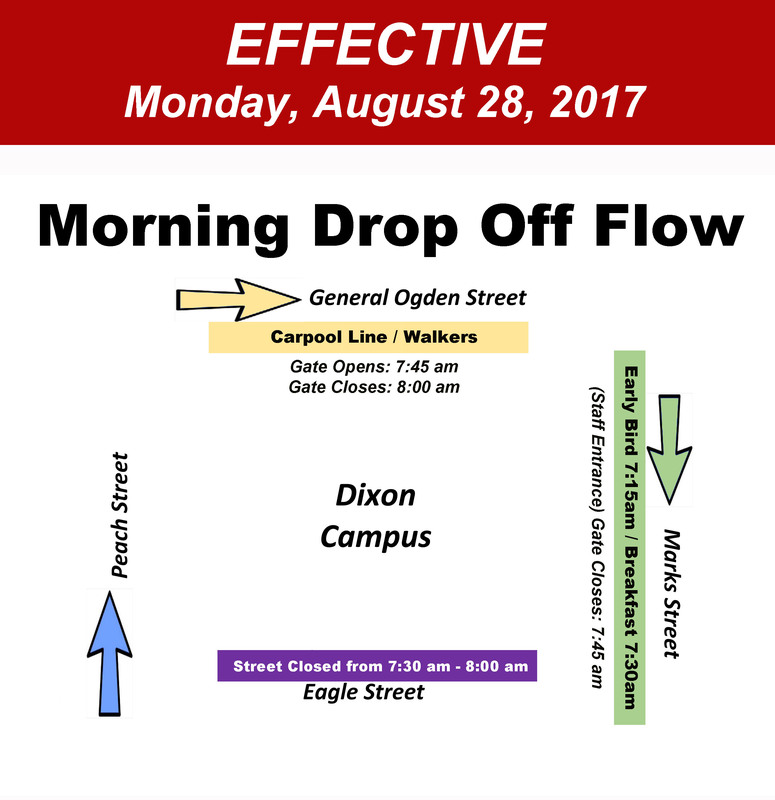 Drop off will be on General Ogden St.
Drop Off Procedures and Car Line Details were provided at Parent Orientation on Wednesday, August 9. 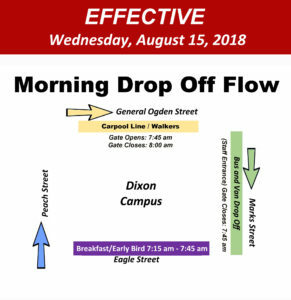 If you were not able to attend this meeting and need information about Drop Off, please contact your campus front office for details (504) 935-4875. 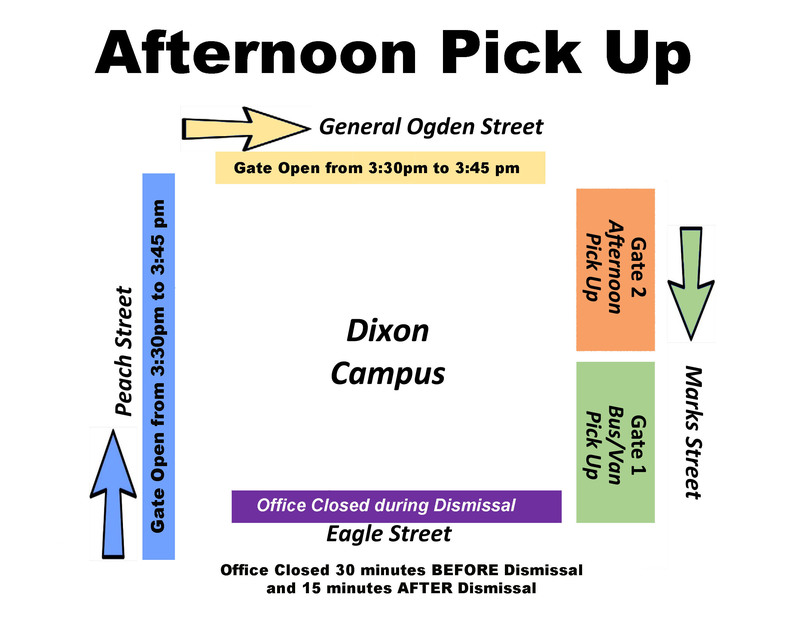 Drop off will take place at General Ogden and makes the block around Dixon Campus as a one-way. Staff and parent volunteers are available each morning to open car doors and welcome your student to school. Drivers in the drop off line must pull up curbside and never stop and let children out from the left hand lane. Many families prefer to park in the neighborhood and walk their children to the gate. This is welcome during drop off as well. Gates close promptly at 8:00am. Students arriving late to school (after 8:00 am) must be accompanied by a parent to the front office. 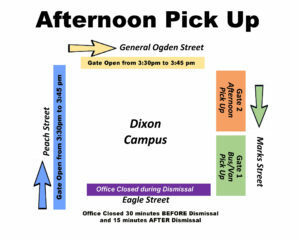 Enter through the main doors on Eagle St.
Students are dismissed from the blacktop Monday thru Friday. After Care Programs (Community Works and Primetime) will share the Marks Street gate​ 1 during After Care pick up. ○ Please note: There are two entrance gates on Marks Street. The gate closest to the Modular buildings (Gate 2) will be locked at 3:45pm​. Only one gate will remain open. The gate leading to the building (Gate 1) will remain open until 5:30pm​ for After School program dismissal. ● ALL parents and/or individuals authorized to pick up students from After Care (Community Works and Primetime) will be REQUIRED to present ID daily in order to be admitted to the building for pick up. * Students will NOT be released early from school within 30 minutes of dismissal time. Students that are on campus 15 minutes after dismissal times will be placed in Prime Time for the afternoon and charged. Your child’s birthday is a very exciting day. We understand that everyone celebrates differently. For this reason, please adhere to the following. Submit an email request to the teacher and cc Mrs. Cinthia Alvarez and Mrs. Catalain Colbert in the front office at least 72 hours prior to the requested day. Please bring all supplies needed. ex: plates, napkins, utensils, etc. We can not provide supplies. If you do not wish for your child to attend birthday celebrations, please inform the teacher and other arrangements will be made. Parents are encouraged to limit the frequency of cakes, cookies, cupcakes, candy and other high sugar, high fat foods and to increase the number of whole grains and fresh fruits provided in lunch bags and snacks from home. This includes guests who are eating in the cafeteria with students. To protect our student’s identity, honor parents photo consent requests, and ensure our students’ and campus safety, PHOTOGRAPHY AND VIDEO ARE NOT ALLOWED ON CAMPUS. If you would like to take video or photos in the building, you may request a photo pass from your family liaison by completing a Photo Pass Permission Request Form. A limited number of passes will be granted to individuals photographing in representation of the class/campus/organization/club and for inclusion in an official ISL communications portal (email, newsletter, website, official Facebook page). Please note- passes will not be granted for personal use. Where can I get the Photo Pass Permission Request Form? Approval is not granted immediately or automatically. Please allow 2 business days from the day your completed form is submitted. For example- If you drop off the completed form to your Family Liaison on a Monday, you can expect to receive the response to your request by Thursday morning. If you submit your request on a Friday, you can expect to receive a response by Wednesday morning. Please note: If your Photo Pass Request Form is not completed properly and must be resent to you, you will need to allow 2 additional days from the day the completed form was received. Your photo pass must be approved by your campus family liaison and Principal, on occasion it also requires approval from the Development Office. If you are a media representative or professional photographer requesting a pass for media coverage or commercial use, this pass must be processed directly with the Development Office by emailing development@isl-edu.org or calling 504-229-4375. You will receive an email confirmation and instructions about picking up your photo pass. You will need to wear the photo pass while photographing on campus. You will need to return the photo pass to your campus front office staff before leaving campus.